The ICT Institute of Excellence in Timor Leste (ICT4TL) is a collaborative institute that offers training and technical assistance (TTA) to the NITL Foundation located in Timor Leste. The ICT4TL Institute will serve as a catalyst to stimulate development of a network of ICT centers which will serve many organizations (i.e., NGOs, governments, communities, schools, churches, educational and healthcare providers, youth groups, etc.) through local partnerships. The ICT4TL Institute will serve as a catalyst to stimulate development of a network of ICT centers which will serve many organizations (e.g. NGOs, government, communities, schools, churches, educational and healthcare providers, and youth groups) through local partnerships. Our goal is to provide support to these organizations to maximize the use of ICT4D for empowering results of “leap frogging” sustainable development and life improvement. 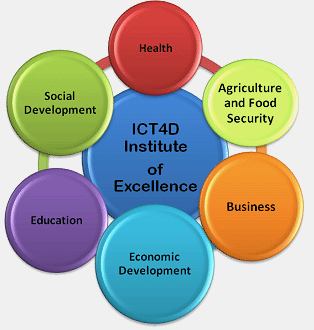 Through this and other approaches, this ICT4D Institute of Excellence will make a significant impact on an improved quality of life. The concept of the Institute is illustrated the following Figure. Publication of white papers that focus on high impact applications of ICT in Timor Leste. Launching of projects of high value to Timor Leste. Presentation of our findings in the UN Infopoverty World Conference (IWC) in March-April 2015 at the UN Headquarters, held annually in New York. Initiation of ICT training programs that are urgently needed in Timor Leste. Clarification of how the ICT4TL Institute will operate, i.e., the Institute will form regional centers and the centers will initiate and manage other projects.